So there I was … one-hundred and thirty-two hours later and a sandwich in my hand. As a parent, the end of the week hits hard, and by dinner time on Saturday night I’m exhausted. People with two full-time jobs understand what I’m talking about. The week sucked up my patience and my awesome culinary skills. When I was single it was take-out night. Thai food. When I was in college it was Cup-O-Noodles night. But seeing how I have a three-year old Pad Prik King, Pad Thai, or Cup-O-Noodles may not be great ideas. So it was pasta for my three-year old kid, sweet potatoes for the baby … and for me … well I had to wait until after their bed time to eat. At nine o’clock at night I didn’t much feel like cooking up a storm and leftovers, well I wasn’t feeling them. So I turned to my deli meats. I sat there on the couch eating a sandwich. I always pride myself in what ever I make. Even my sandwiches are pretty tasty. 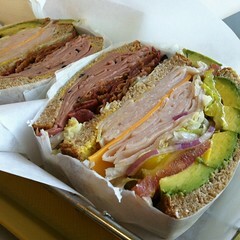 Got the turkey, mortadella, ham, havarti cheese, avocado, deli mustard, etc… But something was missing. Someone else didn’t make it for me. I don’t know if it’s just me, but sandwiches always seem to taste better when someone else makes them for you. I don’t know if it’s because my dad was an awesome sandwich maker, or I enjoyed club sandwiches at delis, but something is always tastier when the sandwich is made for you. Maybe it’s the way they spread the deli mustard, or cut the tomatoes. Maybe it’s the way they leave the french bread in the toaster oven five minutes instead of four. Maybe it’s the Vlasic pickles. Maybe it’s because it’s accompanied by those awesome deli potato chips — the Kettle Chips and not your kid’s Goldfish Crackers. I don’t know what it is, but it happens. It’s tastier. But I was hungry, so I had to make do with my pickle-less sandwich and Goldfish Crackers.